This post was contributed by Erinch Sahan, private sector policy advisor at Oxfam GB. 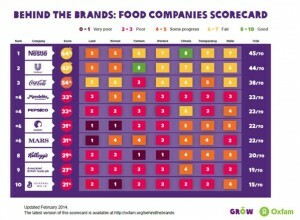 Erinch leads Oxfam’s work on scoring the food and beverage companies for the Behind the Brands campaign. 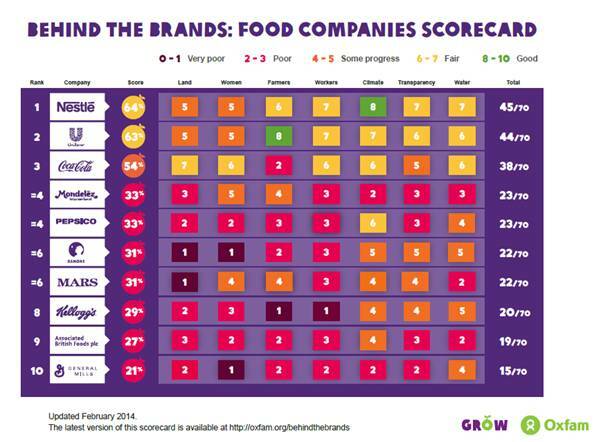 A year ago, we at Oxfam launched our scorecard that assesses the policies of the world’s 10 largest food and drinks companies (‘the Big 10’). With a focus on the rights of workers, farmers and communities in their supply chains, we scored companies on seven key themes that impact the most vulnerable people they impact: workers, farmers, women, land, climate, water and transparency. Do you proactively try to uncover, track and disclose human rights and other social and environmental risks in your supply chain? Do you make commitments to address these issues? Do you require your suppliers to address these issues? Our scorecard only considers publicly available information, because transparency is a key aspect of corporate accountability. We also disclose our indicators, assessments and references on our website, to live up to the same standard of transparency. A year on, here’s how the companies are doing. The companies are on the right track. 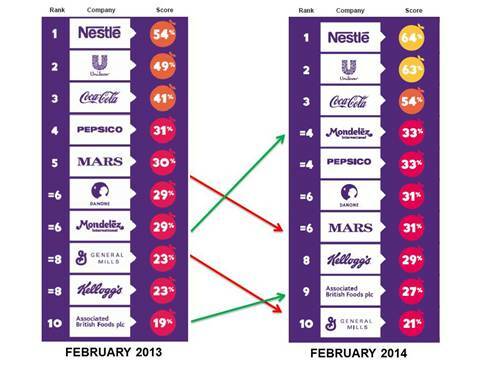 All but General Mills have improved their overall scores since February 2013. 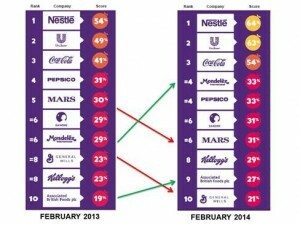 The top three (Nestle, Unilever and Coca-Cola) separated themselves further from the pack, with Nestle’s performance on climate (which includes both mitigation and adaptation) and Unilever’s performance on farmers the two highest scores. On water and workers issues, companies had already picked off the ‘low hanging fruit’ and taken some steps to strenghten their committmens. For instance, a year ago, most companies had already recognised the International Labor Organization’s labour rights conventions and were disclosing key water information through the Climate Disclosure Program’s Water Program. But a year later, still only PepsiCo recognises the UN Human Right to Water and no company has set a specific target to reduce its water use along its whole supply chain. On farmers, only four companies (Danone, General Mills, Nestle and Unilever) mildly improved their performance over the course of the year. Most continue to ignore the importance of ensuring dealings with farmers are fair and inclusive (e.g. through transparent contracts and ensuring farmers are paid fairly). The updated scorecard now also assesses a critical new component of transparency – taxes – focusing on whether companies disclose information linked to the use of tax havens. New indicators on transparency now ensure that we better capture this important theme. People and corporations using tax havens are depriving the world of more than $150 billion in lost revenue, enough money to end extreme poverty twice over. Through our new tax indicators Oxfam aims to identify which companies are most open and accountable in their tax dealings. 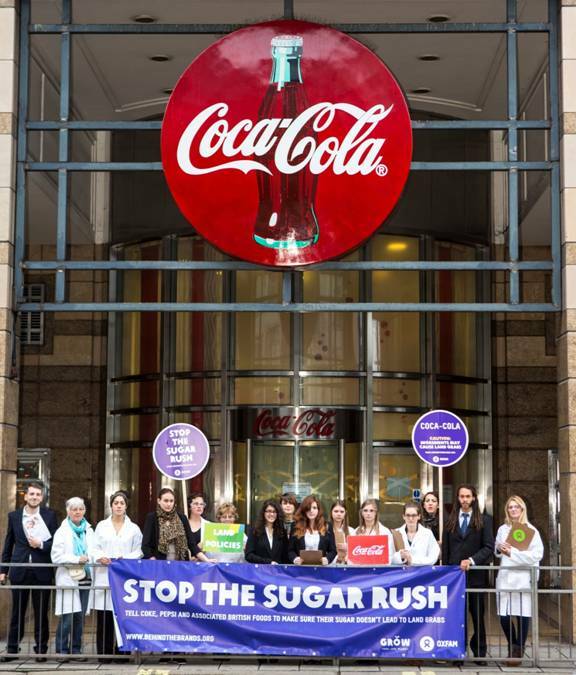 With the exception of Unilever and Coca-Cola, all the companies fail miserably in tax disclosure. We’ll continue to score the companies on these issues, highlighting where they improve and drawing attention to where they don’t. We’ll also keep talking to supporters, investors, civil society and governments to get others to also deliver the message on fair and sustainable agriculture to the Big 10. If companies are to show leadership on these issues (and see their scores improve), they have to start taking some of the tougher steps, including ensuring they pay the prices for their commodities that allow for sustainable production on farms and truly open up to scrutiny by disclosing more about who they do business with and the issues they are uncovering. This needs to be accompanied by giving marginalised people a real voice in decisions. 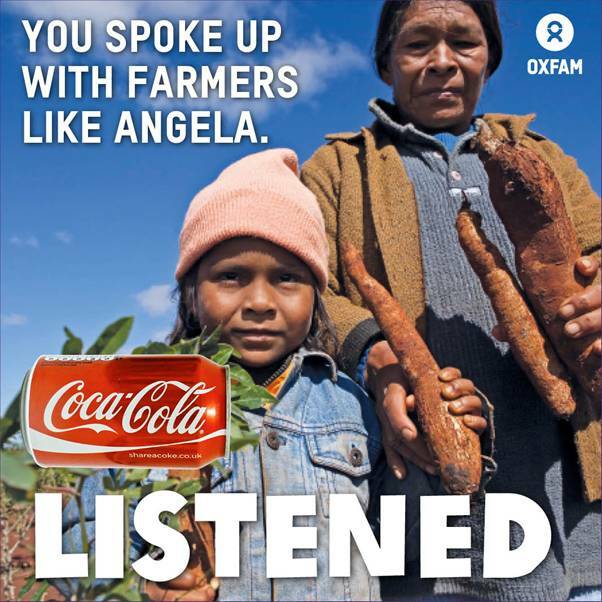 Whether it’s workers having a say in their working conditions through collective bargaining, farmers able to control their destiny through producer organisations or women able to raise concerns via women’s organisations, there are many ways the ‘Big 10’ can use their immense power to give people with little power a real voice. Policies and commitments are a good start but a step-change is needed to bring rights and voice for all to the centre of their business model. 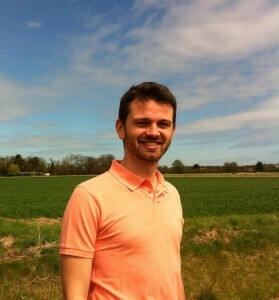 Erin ch Sahan is a private sector policy advisor focused on agricultural markets. 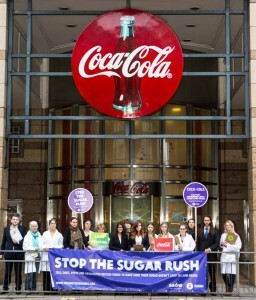 Erinch leads Oxfam’s work on scoring the food and beverage companies for the Behind the Brands campaign. Alongside his work on Oxfam’s campaigns, Erinch works with companies on understanding their impacts on poverty and developing new business models, particularly around agricultural sourcing. This entry was posted in Indices and ratings and tagged behind the brands, coca-cola, human rights, nestlé, oxfam, pepsi, unilever. Bookmark the permalink.